As a Health Science major at Truman, you pursue rigorous training for your future role as a promoter of health, enhance your critical-thinking skills and problem-solving skills, and explore your personal and professional interests through research, internships, and study abroad. At Truman, you will find students are the priority with an emphasis on providing you with problem-based learning and practical experience. You join a community of engaged learners where you can pursue answers to the questions that intrigue you. A unique feature at Truman is the opportunity to engage in research—you can even present your research findings at international, national, regional, state, or local professional conferences, or publish your work in a peer-reviewed professional journal. Our modern labs and equipment provide you with unique opportunities to explore research and individualized study. Work in the Human Performance Lab to measure all aspects of human function. Investigate neural contributions to movement control and movement learning using everything from a Sony PlayStation system to Neurocom’s Balance Master system in the Movement Neuroscience Lab. Learn about human motion, muscle activity, and kinematics in the Piper Movement Analysis Lab. 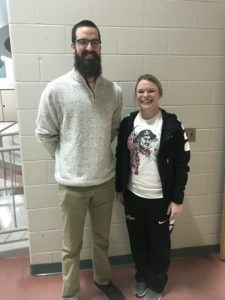 For Human Anatomy class, you’ll work in a human cadaver lab (only 4% of undergraduate programs in the nation offer human cadaver-based anatomy). Our graduates are well-prepared for health careers in educational or clinical settings in school, worksite, community, or public health environments as well as graduate work in public health, health administration, occupational therapy, medicine, or physician assistant programs. 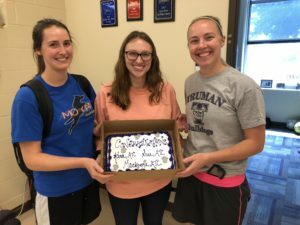 Congratulations to Athletic Training seniors Susanna Goodell-Fields, Mackenzie Snyder, and Kara Wehmyer on passing the Board of Certification exam on their first attempt!